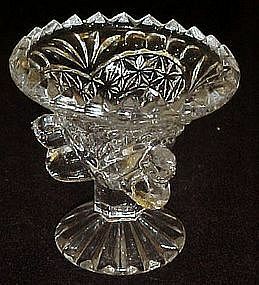 Pretty crystal clear pressed glass salt dip or salt cellar. Three little bluebirds at the base with a pretty pressed pattern. I thought it may be a toothpick holder but this is a little shallow. Measures 2 3/4" tall and is in perfect condition. I now have a cobalt blue one listed also.